I very recently learned about Korla Pandit, from fellow pioneer of the mind Don Mangus -- check out Don's Pandit article on his blog, It Only Hurts When I Smirk. 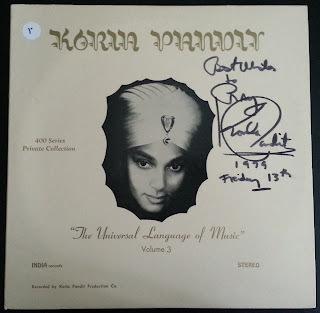 Pandit's story is interesting stuff (see Don's blog for the details), so when I found The Universal Language of Music Volume 3 in Vintage Freak's dollar room the other day, I jumped at it -- especially when I saw it was signed by the man himself, in black marker: "Best wishes to Ray/Korla Pandit/1979/Friday 13th." Cool! "Does anyone know how common autographed copies of this record are?" "Common enough - as a private release (usual trend to this homemade market) the items was "personalised" this way..."
O well, I'm still proud of it, especially since it only has one skip, and was only a buck. You can buy it from Amazon "new" at $25 or used starting at $4.00. You can hear Pandit's The Universal Language of Music Vol. 1 over at the sadly extinct music blog Dinosaur Gardens. Dino Gardens sez Volume One was published 1954. Discogs doesn't give a year for Vol. 3, but it's got a cover of Spinning Wheel (released in '69) on it so it was put out sometime in the 70s, maybe as late as '79, since that's when Pandit's autograph is dated on the cover. The cover of "Spinning Wheel" is rockin' and I'd love to share it on here too, but unfortunately that's where the one skip is. #firstworldproblems. He also covers Lara's Theme from Dr. Zhivago, but the rest of the songs are his. Here's Tone Power!, written by Pandit, "Creating orchestral sounds on the electronic organ and piano," per the vinyl's centerpiece. It's pretty funky.